Larson's Political Economy: Why Is the European Economy Standing Still? Why Is the European Economy Standing Still? The eurozone's [economic] slowdown initially appeared to be due to temporary factors, including unusually cold weather in the early months of the year, coupled with a series of labor strikes and an outbreak of influenza that hit construction and manufacturing activity. This is nonsense. A country's economic growth does not stand and fall with a flu outbreak. Weather swings happen all the time, and short of a Fimbulwinter, cold weather will not stop trucks from shipping goods, surgeons from cutting into people, refineries from producing gasoline - or government from collecting taxes. Labor strikes can have temporary effects on growth, but for that to happen they would have to be of proportions we have not seen in Europe since the British chaos in the 1970s. Long story short: these are the kinds of explanations that people not trained in macroeconomics would come up with to look smart. I weep for those who pay "analysts" to tell them fairy tales like this. The slowdown now appears to reflect more persistent headwinds. 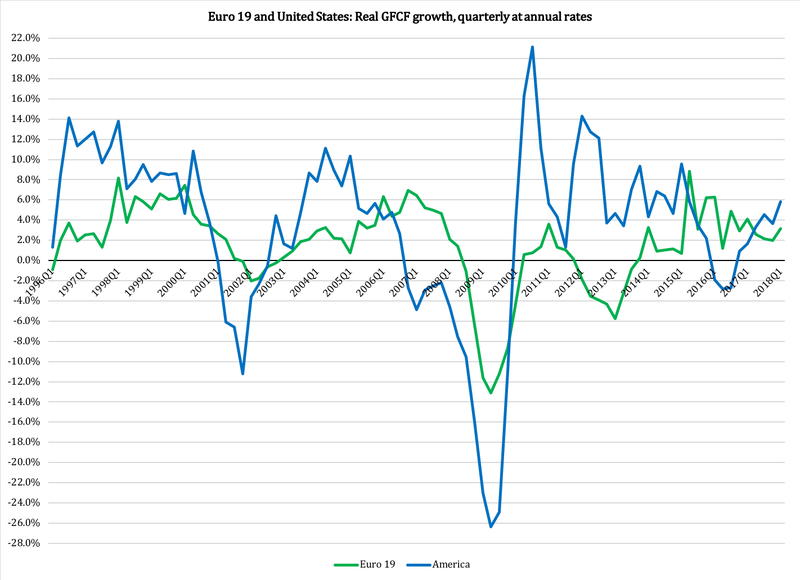 The annualized growth rate of 1.4% recorded in the three months through June wasn't far off the 1.9% average since the eurozone returned to growth five years earlier. And that is in line with official estimates of the currency area's "speed limit," or the rate of growth it can sustain without generating too much inflation. I would not accept the inflation comment at face value, but let us leave that one aside for a moment. What Hannon is really pointing at here is a structural limitation on the European economy. It has built-in caps on economic growth, caps that do not vary over the business cycle. In fact, these caps even prevent the economy from going through regular business cycles, as evident in its long-term growth trajectory. 1. The late 1990s, when President Clinton and Congressman Kasich (R-OH) worked together on putting fiscal conservatism to work. Spending growth was very slow, taxes were predictable (albeit higher than under Reagan) and they even put together PRWORA, a.k.a., welfare reform. On the downside, they also created SCHIP which has since grown to be a costly appendix to Medicaid. Overall, though, the American economy performed well at 4+ percent growth and below-four percent unemployment. By contrast, the euro-zone, which was in the making then, was burdened by a different kind of budget-balancing: higher taxes. The original members of the zone were busy balancing their budgets without touching their entitlement programs, hence the private sector had to pay an even higher price than usual for the welfare state. 2. This is the growth spurt after the Bush tax cuts. Unfortunately, the Republican party, which at this time held both the White House and Congress, could not hold the line on spending like Clinton and Kasich did. Non-defense spending started growing, eventually exceeding six percent per year. The euro zone, by contrast, was held back by the aftermath of the fiscal restraint needed for most countries to be able to adopt the euro; by 2004-05 those restraints were eased and a less austere fiscal policy combined with strong exports to crank up growth. 3. The U.S. economy recovered faster than the euro zone did. The main reason is that while the Europeans were obsessed with balancing their government budgets without conceding an inch on the welfare state - a strategy I have explained in detail in my book Industrial Poverty - the United States actually benefited from a less restrictive approach. The Europeans raised taxes right, left, up and down; the Americans borrowed money and printed money and spent money and built up a debt for the future. For the recession recovery the U.S. strategy was better, but without a return to fiscal conservatism we are going to pay a big, fat price in the future in the form of a Greek-style fiscal crisis. 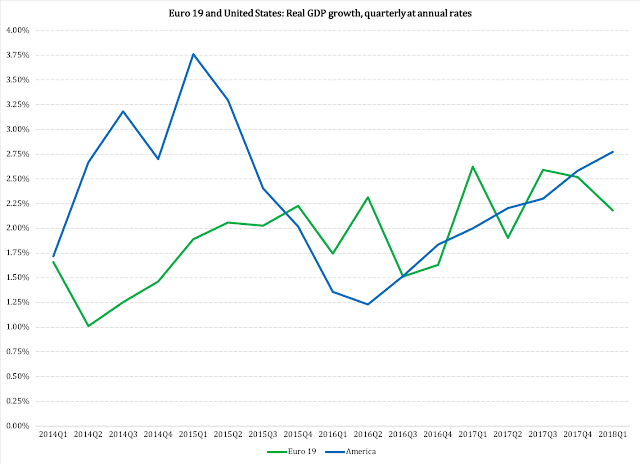 At every turn when the euro zone has fallen behind the American economy, fiscal policy has played a role. With governments on both sides of the Atlantic Ocean being big enough to seriously affect the economy, the choice of fiscal policy is at the forefront of determining the growth rate over time. There is also the problem with the size of the economy. If we include financial transactions, such as pension payments and working-age entitlement checks, the European government is some ten percentage-points bigger than its American counterpart. Add to this the different fiscal policy strategy, where the Europeans desperately try to balance their budgets without conceding any entitlement spending while we dole out as much money as we can, damn the deficits, and the differences in growth rates can easily be explained based on fiscal policy. 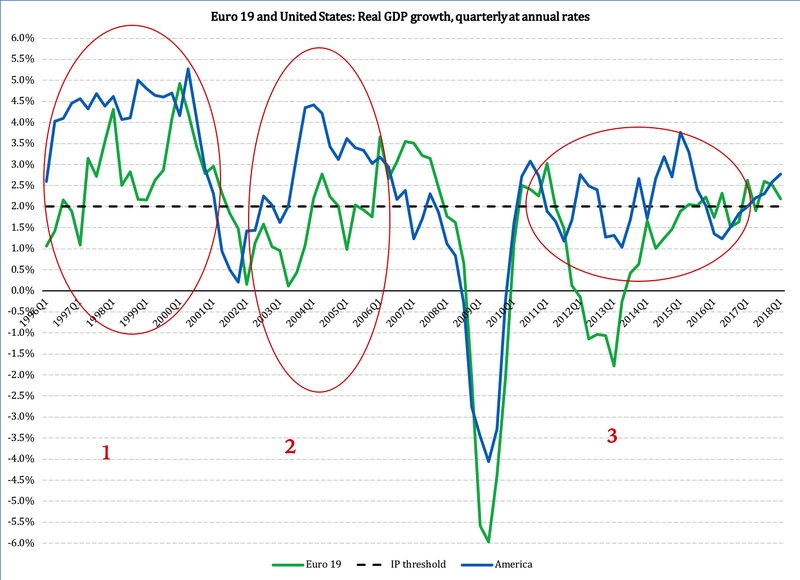 Since 2016, the European economy has been wobbling up and down while the United States is on a steady trajectory of increasing growth - not just growth, but increasing growth. 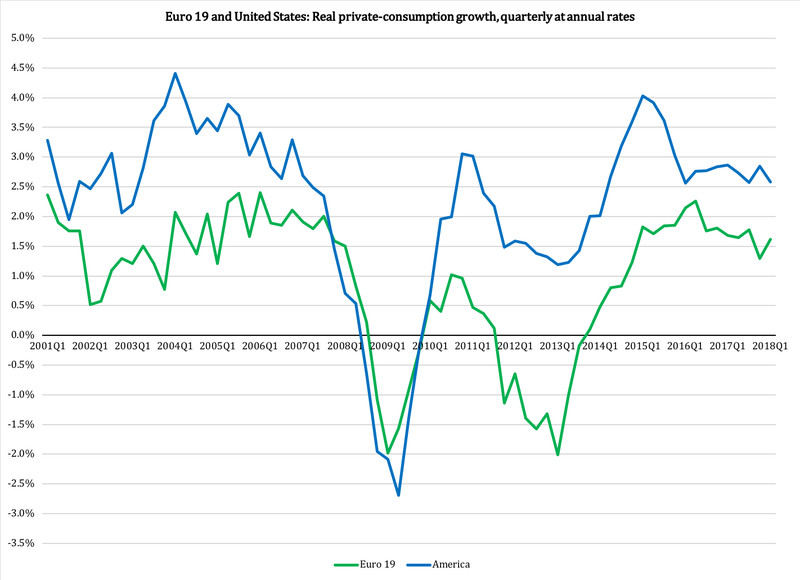 The only point during the past 17 years when U.S. consumption has not grown faster than in Europe is the very bottom of the Great Recession. It is especially telling to see how the recovery phase, from 2010 on, never came with negative growth rates for U.S. household spending. In Europe, by contrast, it dipped again in 2012-2013, correlating strongly with widespread austerity (see chapters 4a and 4b in my book Industrial Poverty). Since the purpose of European austerity is to preserve the welfare state, its fiscal-policy practice means raising taxes - in other words taking more money from taxpayers - while cutting entitlements only when taxpayers have been pushed to the very edge of what they can endure. In combination, these two measures drain consumers of money without increasing spending anywhere else in the economy. The absence of austerity in the United States has left consumers in better shape, explaining why their spending grows faster. Consumer spending is also a larger share of the U.S. economy than it is in Europe. Therefore, when it grows faster it generates more growth per spent dollar than in Europe. A healthy private sector with financially confident families is a necessary ingredient in creating an economy able to generate and sustain prosperity over time. Before we pursue the explanation of why European businesses appear more inclined to spend money than European families, let us note once again the difference between the two economies in the recovery phase after the Great Recession. 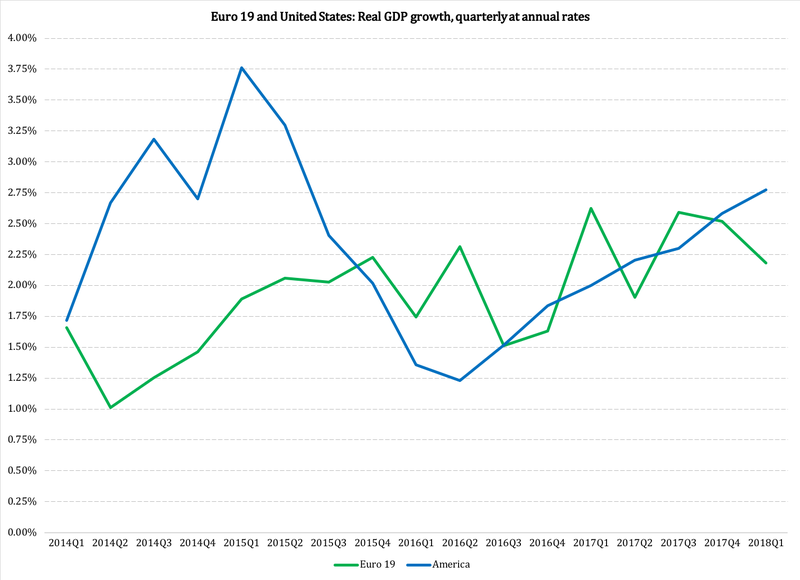 There was a sharp increase in capital-formation spending in the United States, enough to sustain a higher investment growth rate for about four years. We can also see the effects of the European austerity wave in 2011-2013 on investments, as they dip back into the negative during that period. What, then, explains why European businesses appear more willing to spend money than Europe's families? Exports. In many European countries, exports of goods and services are bigger than consumer spending. There is more money coming in to the economy from selling products abroad than from the economy's own households spending money. 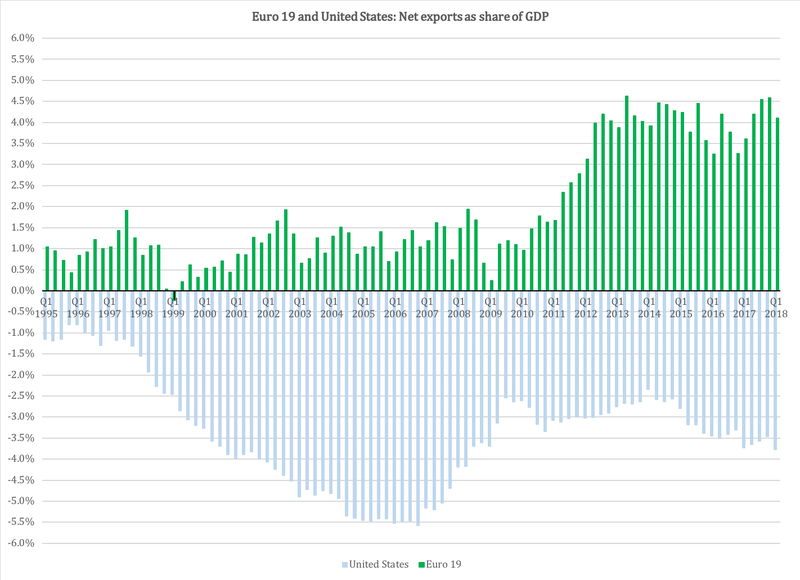 In a nutshell, what has driven the growth spurt in the euro zone that Paul Hannon reported on above, is a surge in European exports. Some economists and policy thinkers believe that it is good for an economy to run major trade surpluses. That is not the case. Positive net exports do not necessarily trickle down to the rest of the economy - as evident in the euro-zone growth rates reported above. 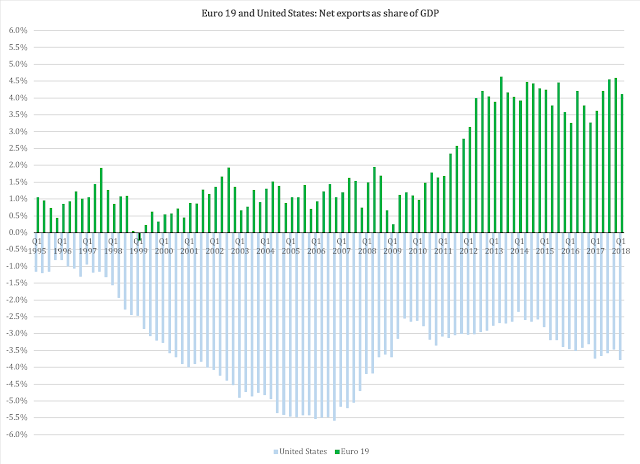 Furthermore, even when net exports grow, as they have in Europe recently, it does not mean that people in general make more money. If that were the case, the trade surplus in Europe would be reflected in strong consumer growth. It is not. Businesses in Europe invest to a large extent to produce for foreign markets; businesses in America invest almost entirely to produce for the domestic market. Is A U.S. "Greek" Economic Disaster Possible? Greece - A Harbinger for the United States? ...we are trying to maintain our welfare state without actually paying for it. The Greeks tried to do the same. They paid a very, very heavy price for it. We can still avoid importing their disaster, but we are running out of time. Fast. *) The sources for all data reported here are: Eurostat (Euro 19) and Bureau of Economic Analysis (United States). **) Please note that government consumption does not include financial transactions, only spending that pays a government employee to perform work.